Planning your wedding is an exciting time, but it can also mean months of frustration if you don't choose the right wedding vendors. These are the professionals who will make your special day a dream come true, but it is up to you to select the vendors who can create your dream wedding without a nightmare. What Wedding Vendors Do You Need? Depending on the type of wedding, there may be additional vendors to consider as well. Some couples enjoy butterfly or dove releases to celebrate their union, and they would need to contract a company to safely handle that wildlife. A couple whose family members and friends have young children may want to hire childcare for their reception. Some couples even envision fireworks as they leave their reception, and it is essential to hire the proper company to safely manage any pyrotechnics. It can seem overwhelming to need so many different vendors to create your wedding day. It is often best to decide where you would like to get married before choosing vendors, as some popular wedding locations require couples to work with an approved list of vendors who are aware of the venue's specific needs or restrictions. Even if the venue does not require specific vendors, they can often recommend different vendors who are familiar with the location and experienced with weddings in the area. Another way to narrow down the list of vendors is through personal recommendations from friends and family members. Couples who have attended recent weddings should ask those newlyweds about their experiences and whether they'd recommend the vendors they used. If you truly love the work of one specific vendor, that vendor may also have recommendations about other professionals they've worked with previously. Ask to see a comprehensive portfolio of their work. This will provide an overview of their style to see if it matches up with your ideas for a perfect day. Visit their website as well. Ask about their personal philosophy about a wedding and the service they provide. You will be more relaxed and comfortable working with a vendor who shares your philosophy. Share your vision of your wedding day, including specific requests that are meaningful to you, and note how willing the vendor is to accommodate anything unusual or extraordinary. Visit another wedding the vendor has worked on, if possible, to see their arrangements in action. This will give you an idea of how easy they are to work with on the big day. Discuss the budget, including how firm their price quote will be. Learn about cancelation or change fees or other costs that may come up through the planning process. 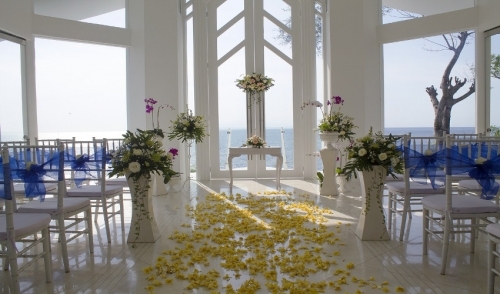 Negotiate the deals of your wedding package, if possible. While you don't want to shortchange your vendors, they should be willing to help find reasonable ways to stay within your budget. Learn about their wedding specialties and whether they have any one area they prefer to focus on. If that specialty does not match your plans, you may want to look for a different vendor. Determine how many weddings the vendor works on at once, including how many events may be near your wedding date. If a vendor's attention is divided, additional problems could arise. Discuss what the vendor's staff is like, including how they are trained, what experience they have and whether any additional staff is typically outsourced for a wedding. You may be excited for your wedding day to arrive, but it is important to take your time when choosing your wedding vendors. These are the people you will be working with to plan the most important day in your relationship, and you want to have experienced, qualified professionals to help make your wedding dreams come true.